4.) What state grows most of the asparagus in the United States? 5.) 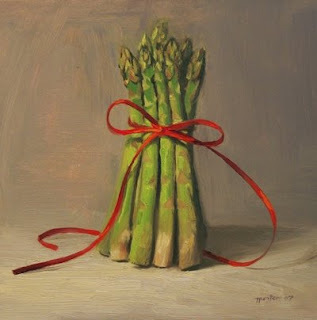 Ancient Greeks and Romans believed asparagus had what medicinal qualities? I'll give you the answers at the end of this post. No prizes, just pride in the knowledge that you know so much about asparagus! Our favorite method is simply lay the spears on a cookie sheet, drizzling some olive oil over, a sprinkle of sea salt (try a "fancy" salt here like Hawaiian red salt or smoked sea salt... :swoon:!!) and then oven roast until done. Heaven. And SO easy. Next up, Asparagus with Pasta. They were MADE to go together. Eat up. 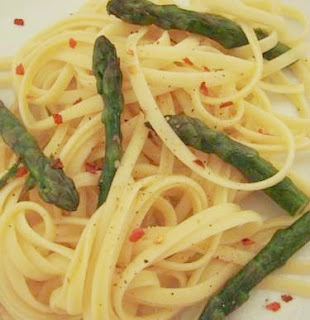 Asparagus is very low in calories and sodium, but offers a a good deal of potassium, Vit. A, folic acid, B vitamins, copper and zinc. 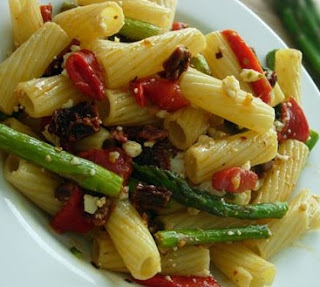 It's also one of the best vegetable sources for Vitamin E.
Pasta and asparagus should just get married and get on with it! I don't think I can imagine them without each other. Mmm..
Yum. Your pasta looks so good. I don't think I knew the answers to any of the quiz questions. I'm a fellow asparagus lover! The only difference between you and me is that I live in the most producing asparagus state, CA, and you're in WA in a close second. I'm sure you'll be passing us by soon enough though. :0) I love your blog so much. I have one too but it can't compare to yours. I absolutely love your recipes. Keep 'em coming!! I love asparagus, but they are extremely expensive around here. 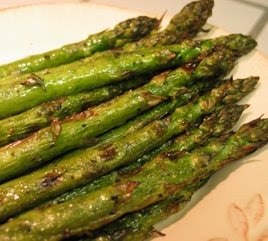 i've decided asparagus IS one of my favorite veggies, especially roasted! i had that for dinner tonight actually. oh...I just love this stuff too! One veggie I can never get sick of. I bought my third bunch in two weeks last night (used some in your creamy pasta dish), and a pasta saute sounds like a good plan! We already do the pasta/garlic/red pepper flakes meal a lot, so we'll throw asp. in with the red peppers I picked up. But asparagus is over $3 a bunch around here!! Love your blog too! Delicious looking and inspiring recipes. I put up a link from the Tofu Hunter. Thanks for your feedback and for your entries! It's almost Seattle Vegfest time! Love it, love it. Good stuff. When we lived in the Spokane area, it grew wild, we would pick it and cook it. When I get "homesick" a big batch of asparagus does it for me. I am now going to go cook some! Oh my gosh, asparagus. Oh my gosh, that pasta looks so amazing. I know I just had breakfast but... I need some asparagus rigatoni now! asparagus was my worst enemy as a kid, but it was the first thing I learned to cook and now I can't get enough of it! your pasta looks especially irresistable!